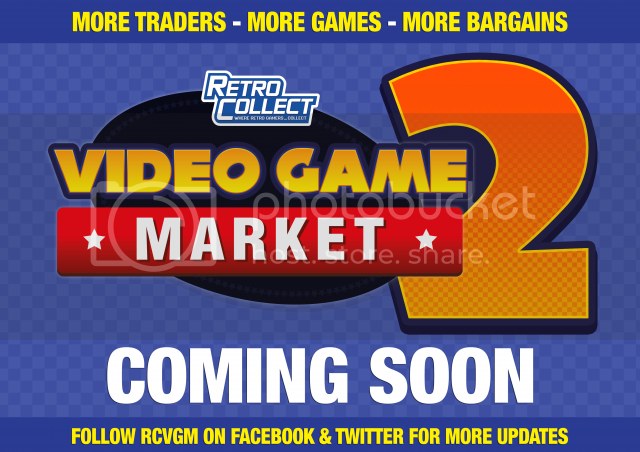 Re: The Video Game Market Sales Fair - Leeds THIS SATURDAY!!! I went to this today. (I want to mention that this is my own opinion and is an indepedent review of the fair). There was a long queue that stretched out of the room through the front door and around the corner. I think this was due to the room being small and having a one-out one-in like policy. I am sure that if the event was done again it would be in a larger venue and the queue would be much smaller. I don't want this to put people off because it was worth the wait. The 1pound entry fee was really good. Inside the room it was packed with people and you needed patience to make your way through the crowd to get to what you wanted to see. But it was all calm and everyone was polite so it wasn't a problem. There were about 15 tables each table was packed full of various games and computers. There was stuff on the table, stuff behind the tables, stuff in boxes under the tables. As well as computer and game stuff there was 2 arcade cabs on free play, and some tables had retro/game inspired art. A really nice sewn picture of Outrun, some nice art of video game characters made from beads. There was loads and loads and loads of games, because it was a video game market I noticed hundreds of SNES games. If you like SNES you'd love this place, you'd be there for hours looking through them. There were second hand consoles and computers to buy. I saw a couple of CPC464s, a few more Spectrums, some Amigas. There were quite a lot of hand held consoles. Loads of carts for various systems both old (e.g Atari) and newer (e.g. N64, SNES, Megadrive). On one side there seemed to be a lot of Spectrum, Amstrad and C64 tapes. Nice to see them there. There were joysticks and things. One guy was selling some special carts for SNES which you could plug in and play games of SDCard I believe. I didn't see cables for CPC or HXC or that kind of thing. Perhaps I wasn't looking in the right places. So much to look at. There were computers to buy at reasonable prices (30 quid for a working CPC464 in nice condition I think was good). I got in there about 2 hours after it opened. I saw the Amstrad dust cover in the flesh. Good quality. If you want one I am sure you will be happy with it. If you missed out on the fair see if you can make it to the next one. i was talking to a couple of the organisers and they were caught totally on the hop by demand; they'd estimated 200 through the door and my ticket was numbered 735! i'm sure the problem will be sorted out by the time they do this again. My ticket was 431. I may have seen you but I don't think we know what each other looks like so we could have easily walked past each other without knowing. PS since it was mentioned, anyone knows of a reasonable supply for SNES flashcarts in Europe? I can only see one photo of it on Twitter, got a link or two? Hi everyone, i have finally recovered from the weekend (and what a weekend it was) so I wanted to give a massive thanks out to everyone who attended, sold at and helped us out at the VideoGame Market on Saturday, its great to see soo many people who are interested in retro gaming, i met lots of great people, caught up with lots of old friends and I'm so happy to see the scene being embraced so well. It was a successful day all round i believe, but there were a number of issues. As it was the first event it was a sort of unknown, we were kind of testing the market for this, but its a learning experience and we can now plan bigger and better for the next one and plan accordingly so we don't get the same issues as this one. The turnout for this took us completely by surprise to be honest, we always thought that there was a demand for a purely sales event but never on that level. So a truly heartfelt thank you for everyone who waited patiently to get in and putting up with the heat and the crowding. We were expecting around the 4/500 mark to turn up over the course of the 6 hours, this is the standard type of volume that the comic fairs, toy fairs and vinyl fairs get in Leeds. We also looked at the big events like Play Expo, Revival, Nerg, Geek, they get lots more visitors but as they have so much more on offer than just selling and are designed to keep you there and entertained for a whole weekend, people go to them for a larger number of reasons, so we honestly believed that 4/500 was a realistic number for the day........ but we actually had over 1500 tickets sold! (and thats not including all of the under 16s who came in for free). The venue had a maximum capacity which we reached early on, and then for health and safety reasons it had to operate on a one in one out policy, so unfortunately it did mean that people had to wait for long periods of time, but as the day went on the queues went down and in the end everybody would have been able to get in. We went through the queue a few times apologising for the wait, giving out sweets and t shirts and everyone we spoke to seemed ok with it (and it looked like a lot of people were making new retro buddies in the queue). So thanks for the patience and understanding guys, hope you all got some good pickups inside. We definitely need a much much larger venue next time and that is what we will get for you guys! In hindsight we should have gone for the main hall room, it is massive and would have had the space to accommodate everyone easily but we have learned a lot from Saturday and we can now plan accordingly for future events now we have real tangible numbers to work with. Let us know your thoughts too, what did you enjoy, what didn't you like, what did you buy too? Personally, it was great to see so much retro goodness in one room, i love seeing all of the games, machines and fellow enthusiasts. Thanks again for coming, thanks to everyone involved and I'm looking forward to seeing you all at the next one. I should have finally gotten driving by end of this year (doing a course now and have my test in May but I'll need time to get a car) so may attend the next one of these. Absolutely awesome. We traded there and as a seller and it was obvious that a bigger venue is required for future events but given this was an unknown quantity the organisers did a fantastic job and on the whole I think the majority left very happy indeed. The only real downer for me was that I had no internet when I returned home and have only just managed to get back online to see everyone's pics, vids and reaction. Hats off to Steve and the rest of the gang for making this such a great occasion and put me at the top of the list for the next one please. Page created in 0.26 seconds with 74 queries.